Today we’re going to do something a little different, and it all started yesterday when I read Trek Tech’s blog post about Becca Tracey’s Reverse Bucket Lists.You see, everyone goes through a point in their life when things just don’t feel so great. Maybe you lost your job, maybe you are really struggling to nail that PR, or maybe you just feel like your life isn’t quite comparing to that wicked amazing friend of yours. Personally, I know I was getting incredibly frustrated with myself over the past month while I was stuck flopping around on the elliptical, most likely gaining weight and losing muscle and endurance. Not my finest moment. However, that is the point of the reverse bucket lists! Instead of focusing on those huge dreams that are still untapped, why not focus on those equally epic feats that you’ve already accomplished. Maybe you already nailed your initial PR? Or bought your first home? Traveled out of country? Whatever it may be, everyone has a huge list of victories that have already been checked off the life list….and those will always be reasons to celebrate how awesome you truly are. Becca did a list of 50 and Trek Tech did 15, but I’m going to stick to a nice round 10. It’s a good number, and I’m cliched, so why not?! 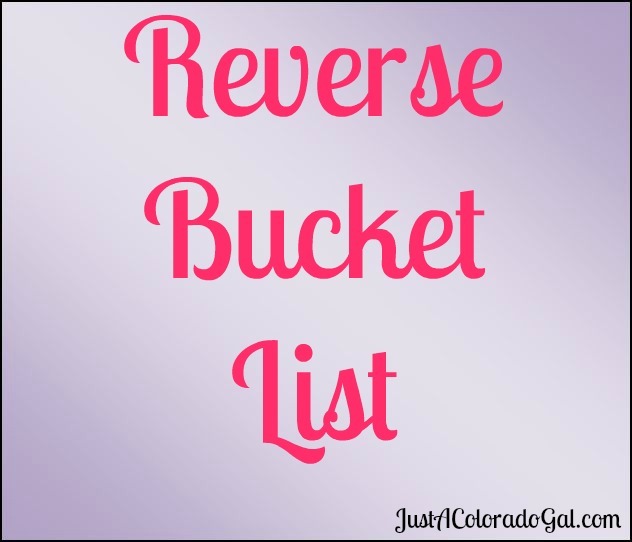 What is one item on your reverse bucket list? If you decide to make a list of your own, definitely let me know! Wow! What an amazing lists of accomplishments! Good for you!! Have you blogged about #6 and #7? I’d love to read about those! Especially 7, how’d you do it??? DO IT! And I have a random series of blog posts about my bike trip that I’ll occasionally add to. I haven’t done one in awhile, so maybe I will soon! And as for #7– it was before our bike trip and year abroad, so I just narrowed it down to the clothes that I would need and that would fit in my backpack. I sold my car and gave away everything else. I was only 23-24ish, so I had accumulated far less stuff! I love this concept! I had an idea for celebration of awesomeness involving listing one’s strengths that I wanted to do for a blog post, but it’s an idea anyone can use! I met the greatest woman in the world, made her mine, married her and started the perfect family. Awwwwwwww, I LOVE this one!! My husband and I do this! We call it our TA-DA list instead of our TO DO list. 🙂 At the top of my list is that I was the first in my family to attend university. Huge for me! I think this is a great idea because it’s easy to get so focused on your new goal that you don’t think very often about how much you’ve already accomplished. That is absolute HUGE that you were the first to go to college– you seriously should be so proud of yourself! And, I love the idea of a “ta-da” list. That is totally fridge-worthy. Wow yours are just out of this world amazing! I could never do 50 unless I included things like “baked really good brownies” or “learned to fold a fitted sheet”. Based on your pictures I don’t think that weight gain actually happened! But see, learn how to fold a fitted sheet IS a good one because I still don’t know how to do that yet!! Wow that is one amazing list! I can only imagine how liberating it must feel to sell all your belongings and have everything you own fit in a backpack. Love the idea of a reverse bucket list. How very awesome and what a great list! This post makes me so happy. You are a global gypsy and I love it. You’re also a total BAMF explorer, which is the reason I’m addicted to your blog. Your adventures are awesome. Thank you 🙂 Although, looks like I’m going to be living vicariously through YOU, Ms. Kenya! Agreed, especially this time of year. There is definitely a time for setting goals and deciding what you’d like to accomplish next, but I think it’s SO important to remember what you’ve already done! I only hope I can inspire my own daughter’s to be so adventurous! I am a natural adventurer who somehow married at 21 and have had many opportunities for greatness…just close to home. Still waiting to leave the country. Good for you awesome lady! Close to home can still be tons of adventure! There is ALWAYS some fun to be had! Love this idea! I’ll have to think about mine and write one, very positive and impressive post! I bagged my first 13er at the age of 16. And I’ve been going downhill ever since! What a great way to make yourself feel better. You’ve had some amazing adventures. I don’t think you have to go far, high or big for something to feel like a grand adventure. Like you said, it could be as much as buying a house. Here’s a handful of mine. * Had my first and ONLY child 😉 and it’s always and adventure. * 5 month long honeymoon living out of a tear drop trailer traveling around the west. * Summited a 14ner with my son who was 2 at the time. His first 14ner. * Learned to surf in Mexico. * 2 week bicycle trip around Costa Rica. I absolutely love this! One item on my reverse bucket list is also that I’ve graduated with my masters. Gotta say-I’m in love with #6 & #7 on your list! Great idea to make a list of things you’ve already accomplished. And you’ve done some awesome things, like that biking. 🙂 And 21 countries, that’s a lot! I mean, as a European, going abroad is easy for me but I’ve got only 11 countries on my list. Few things on my list would be also that I graduated with my Master’s Degree at the age of 24 and getting permanent job right after that. And being with, now my husband, for ten years, since high school. And now taking time of from work to apply to med school. That means reading a lot for an entrance exam. I absolutely adore this idea. So often, I focus on the “next” thing instead of reflect on how far I have come. Your bucket list is so cool – you’ve done so much and so many unique things! Live in a tent for 5 months? awesome! You’ve done some amazing things in your life already and I’m sure the adventures have really just begun for you! mine? MOVE TO COLD CA FROM HOT HOT TX AND ROCK IT! !